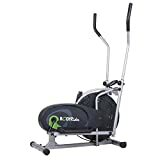 The Body Rider BR1870 Fan Elliptical Trainer is a moderately sized, electricity free elliptical that trains both your upper and lower body using low impact, manual resistance. You might not have any home gym equipment because you don’t have the room for a giant piece of equipment, but you don’t have to have a huge room to be able to work out at home with the Body Rider. Find a small nook in your favorite corner and get ready to get fit fast with this revolutionary and easy to use elliptical machine. This elliptical made it to our top picks for the Best Elliptical Machines of the year. Fan is chain driven so it’s super quiet and won’t disturb anyone else in the room. Motion handlebars provide an upper body workout for top-to-bottom fitness. Console monitor tracks speed, distance, time, and calories burned so you know exactly how hard you worked out. Get a head start on your workout program with the included workout DVD for tips and advice from the pros. The elliptical’s resistance is completely adjustable for a fully customized workout. One of the biggest selling points of the Body Rider is its size. Its compact measurements top out at 35.63″x20.1″x57.7″ (LxWxH), making this a great size for smaller houses or even an apartment or condo. And at 58 pounds, it’s easy to move, too! You can store it in the corner when not in use and easily slide it over in front of the TV or an open window without any difficulty. The lack of “tech” involved in the machine makes it a good sell for people who want something that gives them a brisk workout but doesn’t have a lot of parts and mechanics to have to learn. The display is simple and doesn’t require a large learning curve, but it still displays the basic information you’ll want during your workout. You’ll see your workout time, speed, and distance displayed throughout your workout, and you’ll also get the added benefit of seeing how many calories you’ve burned throughout your sweat session. Users say that the machine’s small stature doesn’t affect its quality at all. Larger users say that it’s still sturdy and strong and doesn’t seem weak or flimsy while being used, no matter how vigorously. Users report that there’s minimal movement and/or squeaking while being used by someone who’s on the heavier end of the weight spectrum, too. Reviews from customers state that they’ve used it successfully at weights higher than 250 pounds with no issues. It’s also easy to put together, requiring minimal tools (that are included!) and only a small chunk of time to put all the pieces together. The instructions are reportedly detailed and have easy to follow pictures to make the building process easier. This is a great elliptical for shorter users because of the machine’s stride length. 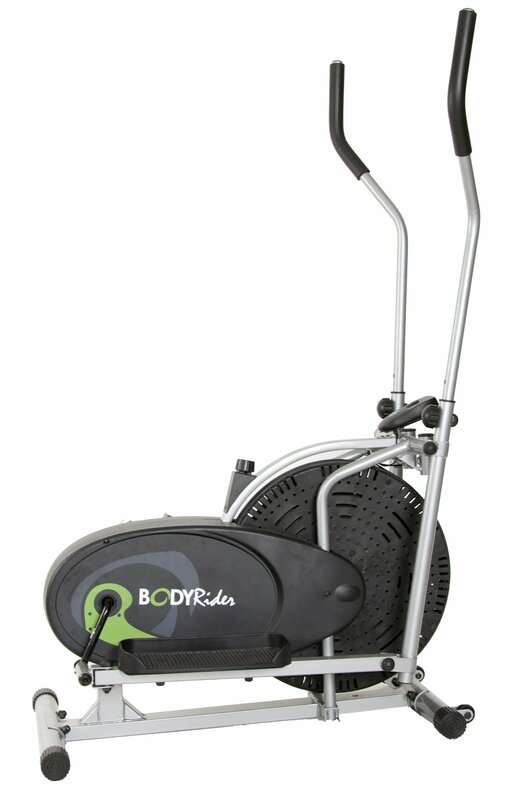 The Body Rider BR1870 has a stride length of 12″ while other ellipticals have a stride length of 18 to 22 inches. It’s quiet when in use, with some reviewers stating it’s not any louder than a mountain bike in use. This means you can easily watch television or hold a conversation with someone else without having to turn the volume way up on your TV or have to shout at your companion to be heard. For busy moms, this is a great piece to have for naptime or post-bedtime workouts without waking the kids up. By far the biggest complaint about the Body Rider is the angle of the foot pedals. Numerous reviews report that the pedals slope downwards, making it difficult to find a rhythm. Other users say that they feel like they’re walking in high heels because of the degree of the sloping. The slope also makes it difficult to comfortably use a higher resistance because all of your weight is in your toes. If you have larger feet, you should be aware that the foot pedals are on the small side, and some Amazon reviewers have said that their feet that are a size 10 or larger fit quite snugly, leading to some discomfort in the toes, especially on a longer workout. Despite the reviews saying that it is easy to put together, most Amazon reviews attest to the fact that there is an incredible amount of pieces in the box. Unpacking is reportedly very time consuming, as is organizing all of the smaller pieces and finding out what piece is what. The average cost of the Body Rider Fan Elliptical is less than $130. This is a very affordable machine, allowing a lot of people on a smaller budget to have a decent piece of gym equipment in their home. With a relatively easy installation and all of the necessary tools included in the box, this is something that almost anyone can put together with minimal effort. Its small footprint makes this a good choice for small rooms or apartments and a good fit for users of smaller stature. Other ellipticals of similar price like the Sunny Health and Fitness magnetic elliptical (retail: $140) have basic digital displays and manual resistance adjustment, but reviews say the machine is wobbly, unsteady, and even more difficult to put together. Overall, the Body Rider gives users everything it promises in an affordable price range. For less than $150, you get an easily assembled, sturdy, and completely functional elliptical with a digital display that will meet all of your basic fitness needs.